To the west of the Monte Rosà, Europe's second highest mountain, lies the Gressoney Valley, part of the Monte Rosà ski area of over 150kms of piste covering three valleys. 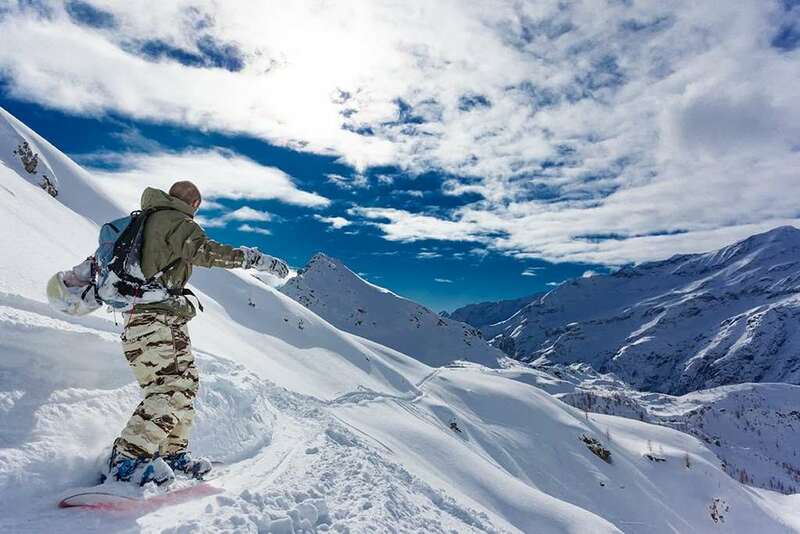 Its Alpine location means Gressoney is one of the most scenic resorts in the Aosta Valley with views of Mont Blanc, the Monte Rosà glacier, the Matterhorn and the Gran Paradiso. 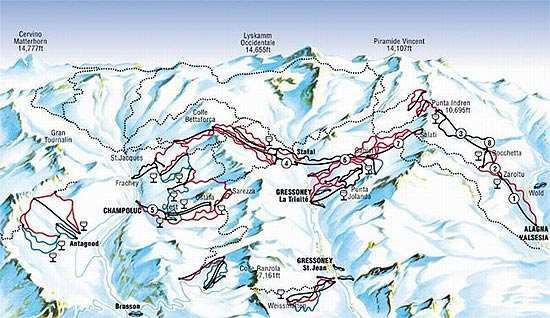 The Gressoney valley has several ski areas: Weissmatten, St. Jean, La Trinité and Stafal. Gressoney has some of the best skiing in the Monte Rosa. Snow reliability is very good, thanks to the high altitude and machines. There is a great terrain for intermediates, while better skiers have access to the excellent off-piste at Alagna. 90% of the Monte Rosa ski area is covered in snow making facilities for more guaranteed skiing throughout the season. Informal and relaxed, Gressoney's night life revolves around the local bars and cafés · In La Trinité the Hirsch Stube is best for draught beer and the Petit Bar for scrumptious home made apple cake. Gressoney offers good restaurants serving typical local specialities. At La Trinité, the Pizzeria Walserchild or the Pulce Bar, Petit Bar for fantastic sandwiches, at Stafal the Capanna Carla or the Kramenthal serve local dishes. The most convenient airport to Gressoney is Turin international airport. Airport transfers are also available from Geneva, Bergamo and Milan airports Malpensa and Linate. With plenty of snow, this is a great resort. Managed 210km in a week, despite snow and wind (according to the on-line ski-pass usage recording site). Not great for beginners or party animals. Excellent off-piste skiing when conditions are right. There are few and long chair lifts, but correspondingly long vertical drops - up to 1.7km on the Alagna side, so long pistes. A bit keen to close links in marginally windy conditions through the week, but we noticed that all was open for the Turin rush on a fine Saturday, although winds were higher than on some weekdays when they closed the links. Mountain restaurants are on the cheap side - 6-7 euros for a huge plate of pasta, 3.50 for a very decent Panini and 4.00 for a large beer as an example. I recommend the Morgenrot below the Bedemie chairlift, and the Ostafa at the top of Champoluc. Gressoney - quiet! One lively-ish bar, but not a resort for nightlife. Hotel Residence is a family-run hotel with a great art collection, friendly staff, clean rooms. Room 106 is not so warm unless they've now fixed the draught excluder. Basic health suite, but everything worked and not busy. It has comfortable bar area, excellent food and reasonable wine list from 14 to silly money euros. The 14 euro wines, as recommended by the owner/manager, were more than good enough at the end of a long day's skiing. Best of all, 20 yards walk from boot room to lift, ski back to the door! Best things are the 1st run of the day was a black. It felt pale grey by the end of the week! Bombadinos, off-piste moguls and the Crystal rep (Sarah). Worst things - Closed links, -19 degrees plus wind-chill - brrrr!